Graecia Vetus ex schaedis Sansonianis desumpta, in qua Macedonia, Thessalia, Epirus, Achaia et Peloponesus, in minores partes seu populos distinguuntur; nec non inter adjacentes insulas speciatim Creta delineatur Insula. 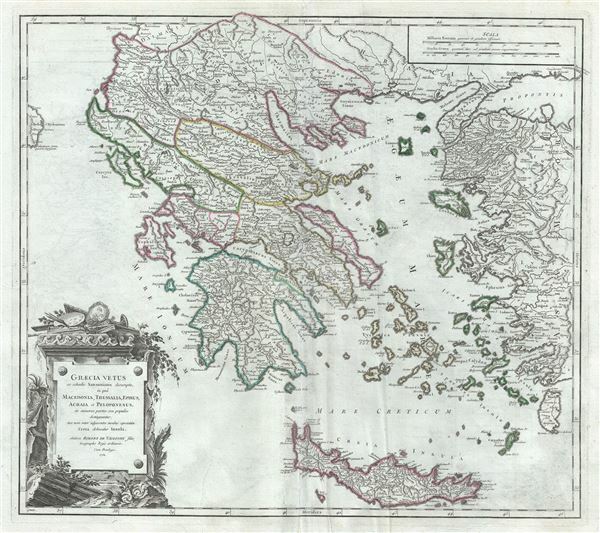 This is an attractive 1752 map of the ancient Greece, the Balkans, and Macedonia by Robert de Vaugondy. It focuses on Greece under the Roman Empire, covering from the Ionian Sea to Aegean Sea and from Macedonia to Crete and includes many of the Aegean Islands and parts of Turkey. It identifies several important cities and towns and uses ancient names throughout. The map includes a beautifully engraved title cartouche in the bottom left quadrant. This map was drawn by Robert de Vaugondy in 1752 and published in the 1757 issue of his Atlas Universal. The Atlas Universal was one of the first atlases based upon actual surveys. Therefore, this map is highly accurate (for the period) and has most contemporary town names correct, though historic names are, in many cases, incorrect or omitted. Rumsey 3353.010. Pedley, Mary Sponberg Belle et Utile: The Work of the Robert de Vaugondy Family of Mapmakers, 369 state 1.